The E J N was valued at $2,000 and had no insurance. E NIELSON (1935) The 18 ton gas screw fishing vessel E Nielson broke her anchor line at 4:30 a.m. Tuesday October 22, 1935 near Cora Point on Coronation Island and stranded. The crew of two escaped but the E Nielson, valued at $3,500 and her 1,100 lb cargo of fresh salmon worth $200 were lost. There was no insurance. The 50 mph NE wind and dark night contributed to the loss. Owner and master John Kayser said in the Report of Casualty that he filed November 13, 1935 that he had “No time to take measures.” The oil screw Venus assisted in the rescue of the two aboard. EAGLE (1965) The 10 ton wooden gas screw fishing vessel Eagle exploded, burned and sank July 31, 1965 at Sitka. EAGLE (1977) The fishing vessel Eagle sank October 26, 1977 in Icy Strait near Dundas Bay. Only one of the two persons on board survived. Nancy Zaid survived floating in a survival suit for eight to ten hours and after making shore walked more than 60 miles before being rescued by a U S Coast Guard Helicopter. Lost was Rick Nelson of Petersburg. EAGLE MARCH (1949) The 13 ton 32 foot wooden gas screw fishing vessel Eagle March was lost near Kake in September of 1949. EARL M (1966) The 10 ton wooden gas screw Earl M foundered September 12, 1966 at Swanson Harbor. ECHO (1970) The oil screw Echo burned September 1, 1970 at Ketchikan. EDCO (1973) The oil screw Edco stranded and was lost September 4, 1973 in Auke Bay, Juneau. EDISON (1916) A strong gale building strength just west of Sitka caused the wreck of the 26 ton gasoline powered halibut schooner Edison at Cape Decision January 16, 1916. All five crewmembers aboard the Tacoma vessel were lost. 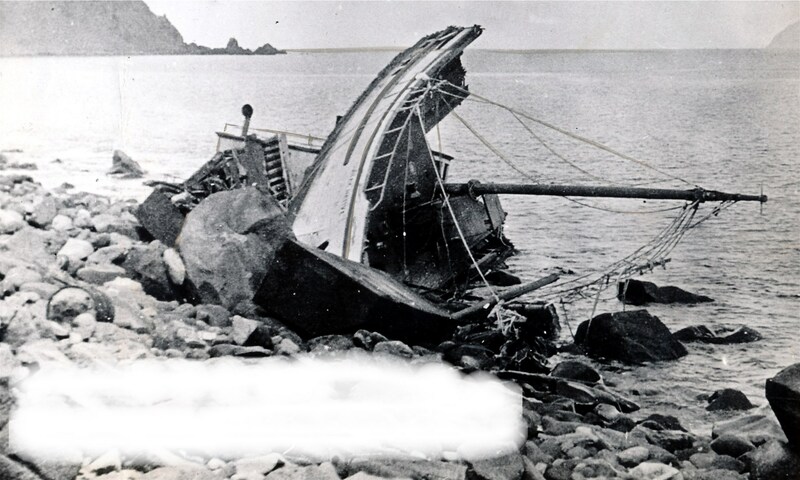 Wreckage of the Edison and her two dories were found on the beach by the schooner Alamera. A license board inscribed with W2439 was also found in the area verifying the identity of the Edison. The entire halibut fleet was forced away from the fishing grounds of the Gulf of Alaska by the building storm and frigid temperatures. EDITH (1926) The 245 ton 120 foot freight barge Edith stranded and was lost May 13, 1926 at Big Port Walter. There was no one aboard at the time of the casualty and no lives were lost. EDITH G (1915) A shift in the wind caused the small gas screw Edith G to drag anchor, strand and break up at 9:00 a.m. November 20, 1915 at the Chilcat Cannery in Lynn Canal. The two person crew of the Edith G had taken the vessel into the sheltered area because of engine trouble. The wind shifted from the north to the southeast with a heavy sea causing both anchors to drag and the 5 ton Edith G stranded. The crew made it to safety but the vessel, valued at $1,000 with no insurance, was lost. Source: U S Coast Guard Report of Casualty filed at Juneau November 22 by P C Cleveland, agent for owner. EDNA S (1946) The 20 ton 42 foot wooden gas screw fishing vessel Edna S burned February 21, 1946 near Hoonah. EDWARD SCHENK (1942) The 18 ton 43 foot wooden oil screw tug Edward Schenk foundered with all hands October 14, 1942 near Tree Point, between Ketchikan and Prince Rupert, British Columbia. The vessel’s cook, Charles F Swanson’s body was the only one recovered. He was reported to have made it to the beach five miles north of Tree Point but died of hypothermia. The two aboard the Effort escaped, but the vessel, valued at $6,000 was lost. Lost with the Eidsvold were half owner and master Frederick Buschmann, John Budinich, J W Budinich, J R MacKie, Mike Pucinich, Edwin Fox and John Simicich. The Eidsvold was valued at $5,000 at the time of the tragedy with $4,000 insured. There was no insurance on the load of salmon. EL LOBO DEL MAR (1979) The gas screw El Lobo Del Mar foundered November 14, 1979 off of Juneau. EL PASO (1949) The 33 ton 58 foot wooden gas screw fishing vessel El Paso burned August 31, 1949 off Sylvester (Silvester) Point. ELFIN II (1963) The diesel screw Elfin II foundered July 1, 1963 in Sergius Narrows, Peril Strait. ELINOR D (1959) The 9 ton 29 foot wooden gas screw fishing vessel Elinor D was consumed by fire August 18, 1959 at Ketchikan. Owner Bob Colette turned the key to the ignition and the boat exploded. The Eliza had departed Juneau at 10:00 a.m. that morning with two aboard bound for Klawock. The vessel was valued at $2,000 and had 300# or $100 worth of machine parts on board. The crew survived but all else was lost as the vessel had no insurance. ELIZABETH (1974) The 12 ton 35 foot wooden gas screw fishing vessel Elizabeth was consumed by fire July 13, 1974 at Tenakee Springs. ELIZABETH (1997) The 47 foot dive boat Elizabeth sank November 12, 1997 near Metlakatla. The cargo shifted causing the disaster. All four persons on board made it to safety. ELLA J (1916) Four crewmen were reported dead and another dying at Wrangell from carbon monoxide gas poisoning aboard the halibut boat Ella J, August 19, 1916. Included among those lost was a Taku Chief. ELLA ROHLFFS (1906) The 76 foot steamer Ella Rohlffs stranded in a snow storm at the north end of Long Island about 10 miles north of Howkan about 7 p.m. December 7, 1906. The vessel was traveling from Howkan to Ketchikan via Coppermount when the accident occurred. There were 12 crew and 10 passengers on board as well as a ten ton cargo of empty beer kegs, timbers and misc. boxes. The cause of the stranding that was listed was a heater that had been brought into the wheelhouse during the snow strorm which had put the compass off. The following day all ten passengers were taken aboard the steamer Cordova to Coppermount. The wreck report does not specify the amount of damage to the vessel or its cargo. No lives were lost. Source: U S Customs Wreck Report filed December 13, 1906 by Frank H Bold, Mgr. ELMIRA (1937) The 14 ton gas screw Elmira broke her mooring chain in a 50 mile an hour wind with heavy sea and drifted ashore at Fanshaw Beach and broke up at 6:00 p.m. January 3, 1937. The crew of two escaped the wreck, but the Elmira, valued at $2,000 was a total loss. The vessel had neither cargo nor insurance. The Elmira had departed Petersburg October 12, 1936 bound for Cleveland Passage. ELMIRA B (1965) The 8 ton 28 foot wooden gas screw fishing vessel Elmira B foundered November 23, 1965 in Sumner Strait. The crewman escaped injury, but the Elmo II, valued at $1,000 was a total loss and had no insurance. ELNA (1966) The 8 ton 29 foot wooden gas screw fishing vessel Elna burned June 27, 1966 at South Point (possibly South Vallenar Point), Gravina Island. ELSIE III (1951) The 9 ton 32 foot wooden gas screw fishing vessel Elsie III foundered October 7, 1951 at Rocky Bay. ELWOOD (1895) The schooner Elwood stranded on the reef and was lost on Gardner Point at 2:00 a.m. December 14, 1895. The vessel departed Seattle September 1, 1895 bound for Kodiak and Cook Inlet. Adrian F Gorton, a Swedish sailor, was lost attempting to make shore. Captain E E Wyman and the rest of the crew managed to reach land clinging to the wreckage of the Elwood. They made their way to Murder Cove and eventually Killisnoo where they were rescued by the USS Wolcott and taken to Sitka. EMILY (1943) The 11 ton 47 foot wooden gas screw Emily stranded and was lost at Juneau January 26, 1943. EMILY BROOKE (1998) The 36 foot sea cucumber urchin dive boat Emily Brooke was consumed by a galley stove fire December 26, 1998 in Bar Harbor, Ketchikan. No one was aboard at the time of the disaster. EMMA ARLINE (1998) The 38 foot salmon troller Emma Arline grounded and was lost February 16, 1998 approximately 10 nautical miles north of Petersburg. Both persons on board made it to safety. EMPRESS (1922) It was 1:30 in the morning July 27, 1922 when the 23 ton wooden gas screw Empress collided with the 25 ton gas screw Vega off Angle Point, Bold Island. The Vega, captained by Mike Ukropane was headed from Ketchikan to Smeaton Bay and the fishing grounds with four crew. The Empress captained by F H Simonds had been fishing in Smeaton Bay and had 20 tons of fresh fish aboard and one crewman and was headed back to Ketchikan. The following are the two accounts of the accident from the two captains taken from the wreck reports filed by each in Ketchikan the day of the accident. The Vega accident report has the Vega’s damage at $10. The Empress, valued at $5,000 and her cargo of fresh fish valued at $500 were both completely lost. The Empress had no insurance. EMPRESS (1941) The 20 ton 45 foot wooden oil screw fishing vessel Empress was consumed by fire July 20, 1941 at the entrance to Traitors Cove in Behm Canal. EMPRESS (1962) The 71 ton 78 foot wooden oil screw fishing vessel Empress burned May 15, 1962 near Pleasant Island in Icy Strait. ENOS (1955) The 25 ton 45 foot wooden oil screw fishing vessel Enos stranded and was lost August 14, 1955 at Lazarita Island. EQUINOX (1983) The crab fishing vessel Equinox capsized and sank March 13, 1983 in Lynn Canal two miles east of Haines. EQUITY (2012) The 42 foot troller Equity struck a rock and sank December 14, 2012 southwest of Heceta Island. The crew issued a distress call over VHF Channel 16 and abandoned ship in survival suits to a life raft. Good Samaritan fishing vessel High Pockets responded to the radio call and recovered the three crewmembers of the Equity and transported them to Klawock. There was no loss of life, but the Essu, valued at $3,000 was a total loss with no insurance. She was later salvaged, put back into service and burned again in 1946 at Wrangell. ESSU (1946) The 9 ton 32 foot wooden gas screw fishing vessel Essu was consumed by fire in the small boat harbor at Wrangell on March 27, 1946. ESTEBETH (1948) The 70 ton 55 foot wooden oil screw Estebeth was destroyed by fire March 31, 1948 off of Point Couverden, 55 miles from Juneau. ESTELLA (1939) An engine backfire caused an explosion and fire which destroyed the 13 ton gas screw Estella at 8:30 a.m. Tuesday August 22, 1939. Owner and master Claude Yeisley of Ketchikan and his only crewman, Charles Kennedy were thrown from the cabin of the Estella when the blast occurred and were able to escape the vessel. The Estella, valued at $3,500 burned where she sat in a small cove immediately north of Wards Cove. There was no cargo and the Estella was insured for $2,000. ESTELLA (1996) The 58 foot fishing vessel Estella ran aground and sank July 25, 1996 in Sukoi Inlet. All six on board made it to safety. ESTER (1958) The 9 ton 34 foot wooden gas screw fishing vessel Ester burned September 5, 1958 at Camp Coogan Bay near Sitka. ESTRELLA (1952) The 7 ton 38 foot wooden gas screw Estrella burned May 20, 1952 at Clover Pass. ETOLIN (1933) The 17 ton 43 foot wooden gas screw fishing vessel Etolin foundered in Kasaan Bay August 4, 1933. The five crewmen aboard made it to safety. According to the casualty report, the Etolin was valued at $2,500 and her cargo at $50. Insurance on the vessel, which was a total loss, was $1,000. ETTA (1966) The 17 ton 41 foot wooden gas screw fishing vessel Etta was lost on September 11, 1966, after a collision with the My Laddie approximately 5000 feet off shore from Beacon Point. EURUS (1927) The 18 ton oil screw Eurus was lost in Dixon Harbor at 12:05 p.m. Friday November 4, 1927 after a collision with the USCG Cutter Unalga. The Unalga had towed the Eurus into safety after the Eurus broke down in Cross Sound near Cape Spencer. The tow line parted in Dixon Harbor and while attempting to get another aboard the Eurus, the Unalga punched a hole into the Eurus which sank in 20 minutes. The crew of two from the Eurus was taken aboard the Unalga. EVELYN G (1921) The 13 ton wooden gas screw Evelyn G stranded and was lost at Point Arden, Stephens Passage 7:00 p.m. Sunday November 20, 1921. According to the casualty report filed by owner and master Paul Kegel of Douglas, “water in gas froze and cut off fuel supply.” “Endeavored to start engine, lost rudder and vessel drifted ashore.” Kegel and one other crewman were on their way from Petersburg to Juneau with no cargo. The crew survived but the Evelyn G was a total loss. EVELYN MARY LOUISE (1996) The 32 foot fiberglass fishing vessel Evelyn Mary Louise burned and sank March 29, 1996 at Metlakatla. There was no loss of life. EVELYN S (2001) The 70 foot fish tender Evelyn S flooded and sank August 27, 2001 in the Gulf of Alaska 52 nautical miles south of Yakutat. A leaking shaft seal flooding the engine room precipitated the disaster. All three crewmen abandoned ship and were rescued with the aid of the U S Coast Guard and fishing vessel Gandil. EVENING STAR (2012) The 50 foot purse seine fishing vessel Evening Star capsized and sank in Slocum Arm August 2, 2012. The crew had just hauled a large set of pink salmon over the starboard rail when she capsized and sank. Four crewmembers were deposited into the water and retrieved by the fifth crewman who was operating the vessel’s seine skiff. All five were rescued by the fishing vessel El Dorado who was working nearby. As a result of the pollution potential caused by the sinking of the Evening Star, the pink salmon fishery in Slocum Arm was closed down for three days. EVIE (1968) The gas screw Evie foundered and was lost October 5, 1968 off of Point Stanhope. EXHIBIT (1961) The 21 ton 40 foot wooden oil screw Exhibit was consumed by fire August 18, 1961 at Hydaburg. EXPLORA (1929) The 10 ton wooden gas screw Explora caught fire and was lost at 9 p.m. Tuesday November 5, 1929 at Herring Creek on the east side of Wrangell Island. The two person crew survived, but the Explora, valued at $1,500 was a total loss with no insurance.